Create consistent community by providing weekly running, walking or cycling clubs. 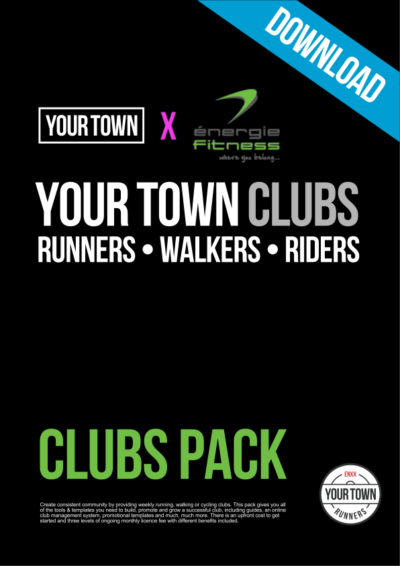 This pack gives you all of the tools & templates you need to build, promote and grow a successful club, including guides, an online club management system, promotional templates and much, much more. There is an upfront cost to get started and three levels of ongoing monthly licence fee with different benefits included. Create consistent community by providing weekly running, walking or cycling clubs. This community pack gives you all of the tools you need to set up, or indeed promote, your own running, walking or cycling club. More than just a how-to guide, this pack contains tools & templates that enable you to hit the ground running with personalised branding, promotional templates, and products. With your own bespoke community logo based on the first half of your local postcode, you have the chance to make a club with a uniquely local feel, whilst being a part of a national network that can support you. With the Clubs Pack there is an upfront cost for the pack, but you must also choose a monthly licence subscription and support level. Online platform for club members to manage registration, waivers & attendance tracking.